Quality Control | Anderson Hay & Grain Co., Inc.
Anderson Hay follows a rigid protocol for insuring traceability of all our products. From planting to harvest, we team with our grower network of family-owned farms specializing in hay and straw production to provide a consistent supply of top quality products to our customers all year round. Our efforts in quality control start with our growers and move through our entire operation. We are committed to supplying safe feed and ensuring that all steps, from traceability and inventory management to processing and transportation, are completed to the individual customer’s specifications. Our inspection process begins in the fields before harvest. 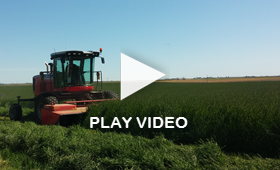 Clean, weed and grass free fields are essential to growing high quality hay. Bales are continuously inspected throughout the production process for quality and foreign material. 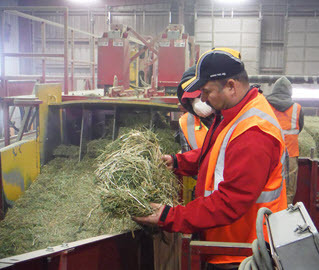 Each stack is inspected a minimum of five times, three of which are quality control checks of each individual bale. Each bale of hay or straw we sell can be traced back to the field it was grown on. Detailed records of chemical treatments, harvest timing and crops previously grown on the field are kept to ensure that customers are well informed and can choose hay that meets their requirements. We can trace our products through a stack number that is assigned in the field. The hay maintains the identifying stack number through delivery at the port. At any time throughout the process, our application of advanced technology allows us to know the location of each stack we sell. 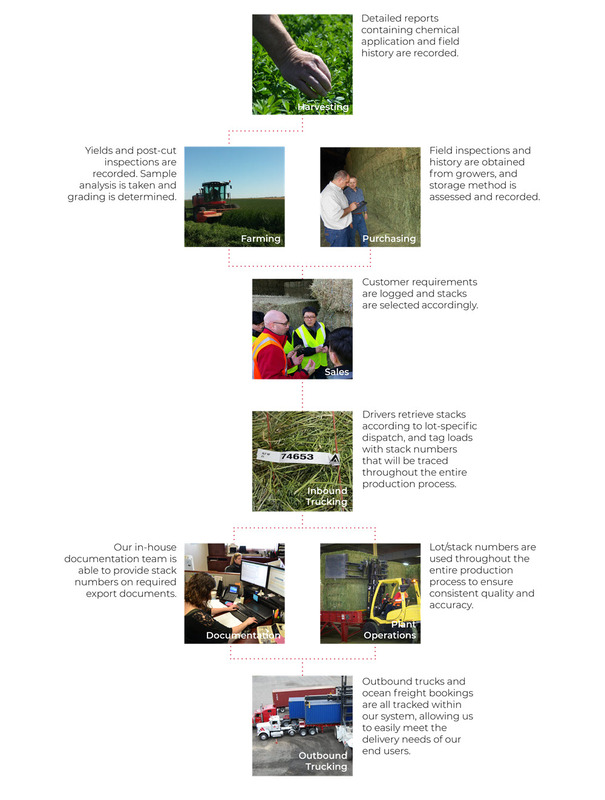 Our investment in technology brings traceability standards well above the feed industry norms. To find out more, download our PDF on our Traceability Standards.